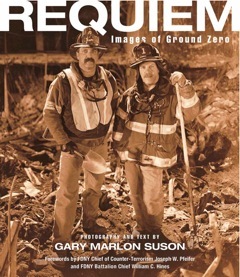 Special Edition Cover of Gary Suson's "Requiem: Images of Ground Zero". The word "charity" can be blown out of proportion and/or misused, but a Manhattan photographer embodies the word, while also earning praise from 9/11 family members. When Official Ground Zero Photographer Gary Suson was "discovered" by Manhattan Trustee Rudy Sanfilippo of the Uniformed Firefighter's Association back in 2001, Sanfilippo had a few words for Suson before he plunked Suson into the belly of Ground Zero. Suson clearly remembers Rudy Sanfilippo's words as he was walked into the "hole" at Ground Zero: "If you ever make substantial money from your images, you WILL do the right thing by 9/11 charities." Twelve years later, Suson is doing just that. With a collection of photographs eloquently dubbed "Rare Photos" by the New York Times, Suson's 9/11 images have become the hallmark for tasteful remembrance of a tragic event while at the same time serving a charitable purpose. In 2005, Suson founded the Ground Zero Museum Workshop in the Meatpacking District, which feature his images and donated artifacts. The Museum struggled to stay afloat in the beginning, with donations to other 9/11 charities being nominal. Say's Suson, "In the first few years it was a HUGE deal to raise $20 for charity. We barely had enough money to keep the doors open." However, word spread fast about the "Biggest LITTLE Museum in New York" and by 2010 GZMW had rose to #1 Most Popular Attraction on Trip Advisor. Charitable donations grew from $20 to the thousands, with charities such as the FDNY Foundation for the Children of Fallen Firefighters reaping the benefits. FDNY Firefighter Ralph Geidel, Cancer Survivor Whose Brother Was Killed on 9/11. In 2010, Suson learned that FDNY Firefighter Ralph Geidel, who lost his eldest brother firefighter Gary Geidel of Rescue-1 on 9/11 (and spent nine months digging at Ground Zero) had throat cancer and couldn't pay his medical bills. With most his teeth falling out or damaged from chemotherapy, Geidel had a $20,000 dental estimate looming to repair the damage. Shockingly, Geidel was getting no 9/11-related federal assistance to pay for his medical bills. Enter Gary Suson, who had dug at Ground Zero for many months in 2001-2 with Ralph, his brother Mike and their father Paul Geidel. Suson created a special, limited edition version of his Barnes & Noble book, Requiem: Images of Ground Zero (printed in the UK) featuring Ralph and his brother Michael on the cover. The image of the brothers had been featured on CNN & FOX many times and was rather well-known, so it was a fitting choice. Only 400 copies were produced, signed & numbered by Suson, which ultimately raised $13,000.00 to help towards Geidel’s dental restoration bill. Says former FDNY firefighter Ralph Geidel, ”People like Gary Suson are rare in that he quietly gives of himself to help others negatively affected by a national tragedy. Twelve years after 9/11, there aren’t many people doing what he does. He should be commended for it.” Echoing Ralph is his father Paul Geidel, a retired FDNY Lieutenant & Korean War veteran, who spoke about Gary Suson's Museum Workshop: “It’s a beautiful and tastefully designed museum that preserves the memory of those lost while educating the public about our Recovery work at Ground Zero. Mr. Suson’s museum & book has helped my son Ralph out with his post-cancer medical bills and my family is most appreciative." 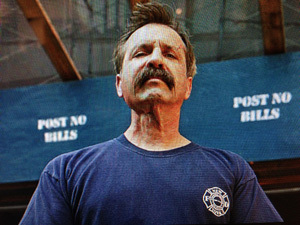 Mr. Geidel spent nine months digging for his missing firefighter son but never recovered him. 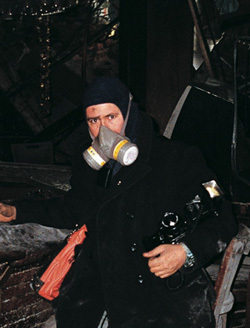 Gary Suson, Official Photographer at Ground Zero in WTC Subway, 2001. On average, Ground Zero Museum Workshop, a 501c3, donates significantly higher to charity than the customary 10%. In 2009, after paying museum operating costs, salaries and bills, Ground Zero Museum Workshop gave 50% of the remaining cash profits to charity, in 2010 gave away 60% and in 2011 gave away 27.5%. Meanwhile, in 2013, Gary Suson takes no regular salary at GZMW. Suson, who suffers from severe, chronic PTSD from working 7 months at WTC, does not frequent the Museum much these days, focusing more on his WTC-related health issues. He has gone through an exhaustive PTSD program at Columbia University Hospital. "I was forced to re-live all my experiences at Ground Zero in order to learn how to cope with the past and similar situations that could arise in the future. Without the program I'd be lost. Those that worked at WTC know the horrors of what we saw. The things that are never printed in papers." Suson has been under the care of environmental illness specialists every week without fail since September 11, 2001 to treat his Chronic Obstructive Pulmonary Disease (COPD), taking nearly 25 injections in his arm each week to stimulate his immune system. “It’s the un-glamorous part of documenting our nation’s worst tragedy,” says Suson. With thousands of 9/11 workers sick and/or passing away, Suson has made his health a full-time job. He was diagnosed with pulmonary injury in 2003 and awarded funds by the 9/11 Victim’s Compensation Fund to pay for his medication. Every Wednesday for 12 years he rides the train two hours to Hicksville, Long Island for immunotherapy. Yet through it all, Suson keeps raising money thruogh his museum and book sales to help those affected by 9/11, while at the same time educating visitors from all over the world about the “Recovery” at Ground Zero. He hopes to raise the remaining $7,000.00 needed to repair Ralph Geidel's teeth in the coming year. "Ralph is a great guy and has been through a lot. It's an honor to assist him," states Suson. 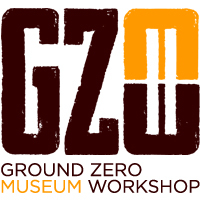 Ground Zero Museum Workshop Logo, NYC. “I have an image collection with the ability to educate & also raise substantial monies for those in need, so it's a win-win,” says Suson. “When you are placed into a position like I was, you have to at least try and do good things with it.” GZMW, which features 100 Images & Artifacts and the stories behind them, is currently rated #13 on Trip Advisor out of 730 NYC attractions. The Museum, which was just ranked in the 25 Top Museums in the USA by Trip Advisor, is tiny – some call it a 'shoebox' museum – and Suson calls it the 'little engine that could'. Says Suson, “Big things come in small packages. GZMW was inspired by my visit to the Anne Frank House, another tiny yet powerful museum.” Suson has counseled dozens of sick 9/11 workers on vitamin & environmental therapies to boost the immune system and even built a special page on his museum website to educate sick workers on ways to improve their health.